The Buddha Myth--A Skeptic's Guide: WHO WERE THE SCYTHIANS/SAKAS? Woe to us, for we are plundered!" Thus prophesized Jeremiah of Judea around 627 BCE, (Jeremiah, 4:13). In about 625 BCE the horsemen known to the Assyrians as Iskhuzai, and Greeks as Skythos or Skutai, (Scythian), invaded Syria and Judea and would press as far south as Egypt. 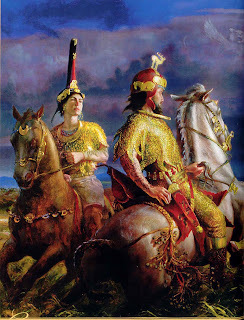 Scythian nobleman and his wife on the Central Asian steppes. (National Geographic). The Scythians were a nomadic Central Asian steppe people; branches of these people migrated south into Persia and India, (where they are called Sakas), and west into the Black Sea area. Herodotus was the first to write a detailed history of them; many of his observations have been proven as reliable by recent archaeological findings. Here he describes the burial of their kings under huge mounds. The kurgans or burial-mounds that dot the Ukrainian and south Russian steppes and the forest steppes bear testimony to Herodotus’ accuracy here. Sixth- and fifth-century royal tombs were as Herodotus describes, rectangular shafts between 10 and 15 meters deep, within a raised mound above. Some later mounds are as high as a three-story building, and the base of the mound can extend to a diameter of over 100 meters. The use of animals and most often the lion on the capital of the Ashoka columns and as the Mauryan royal emblem; the Sakas introduced animal art to India. Construction of stupas (burial mounds) all over India, derived from the steppes burial mounds. The Buddhist wheel motif is derived from the wagons and chariots of the steppes. The concept of the universal monarch, or chakravartin, is derived from the steppe peoples. 8. the appearance for the first time in the steppes, of complex horse harness, which suggests a qualitative improvement in techniques of riding. As can be seen in the maps below, tribes of Scythians were moving slowly into Gandhara and Northwest India. 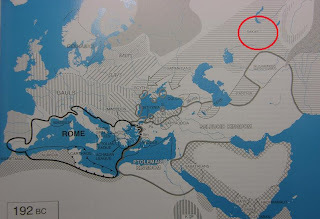 By the first century CE, they controlled much of this area. So it seems entirely plausible that Buddha could have been a member of this powerful tribe. 515 BCE: Saka was the Persian name for the Scythians. 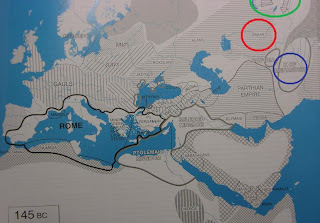 In 515 BCE they occupied the western Asian steppes, (red circle), northwest of Greater Gandhara, (light blue circle). Buddha was born between the periods shown in this and the following map, [i.e. 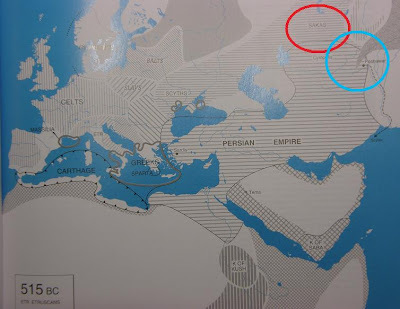 between 515-301 BCE], somewhere in or near the red or blue circles. 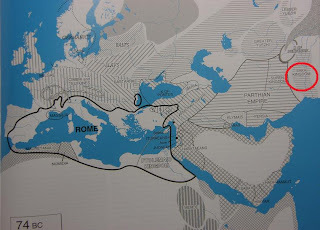 Click to enlarge maps which are taken from Penguin Atlas of Ancient History, (copyright infringement not intended). 301 BCE: The bulk of the Sakas were still in the western Asian steppes, but of course, some tribes must have trickled into Greater Gandhara long before a Saka kingdom arose there. The Mauryan empire, (blue circle), had arisen in Gandhara and further east in India proper. 192 BCE: Sakas still in western Asian steppes but Mauryans fade from Gandhara at this time. 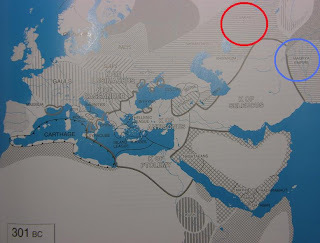 145 BCE: The Sakas are still on the west Asian steppes but begin to be pressured by the Yuezhi, (green circle); the Indo-Greek kingdom of Menander, (of Milindapanha fame) is established in Gandhara, (blue circle). 74 BCE: The Sakas, driven southeast into Gandhara by the Yuezhi, (Kushans), finally establish their kingdom in Gandhara. 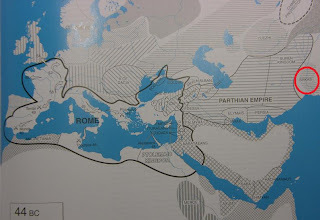 The Indo-Greek kingdoms collapse. 44 BCE: The Sakas are still in Gandhara; eventually they are driven by other steppe peoples east into India proper. 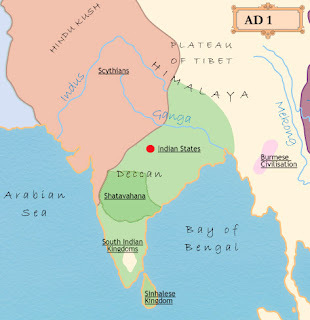 By the first century CE the Indo-Scythians, or Sakas, controlled a large chunk of territory in North-West India and what is now Pakistan and Afghanistan. Nice to view your blog. Please visit my blog also. You can also contact me for sharing of our view on history of Thailand and Burma.